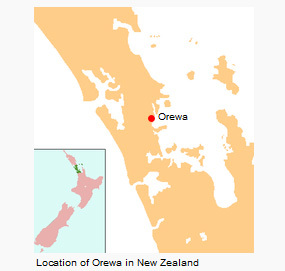 Orewa, a town in New Zealand’s North Island, lies on the Hibiscus Coast, 40 kilometres north of central Auckland. Orewa Beach is one of the longest and safest beaches in Auckland, and is a great place for swimming, surfing, kayaking, windsurfing and long, relaxing walks. The town of Orewa spreads inland from the edge of the beach. For coastal views, you can’t beat a stroll along the Millennium Walkway. Near the waterfront are lots of excellent restaurants and cafés. Beyond the beach, entertainment possibilities include golf at Gulf Harbour, wine trails, hiking in regional parks, ten pin bowling, cycling, mini golf, cinema, horse riding, go-karting, Puhoi Pub and Matangi Island. Even on a rainy day there’s still lots to do – you can visit movie theatres, thermal hotpools or even ski all year round in the Snowplanet snow dome.